Dr. Becker’s article doesn’t go into the fact that cats are known to be lacking in an important liver detoxification enzyme called glucuronosyltransferase. We now know, for instance, that this is why Tylenol and aspirin can be fatal to cats – their livers cannot clear these substances safely even though most others mammals (like you and I) can. PLoS One. 2011 Mar 28;6(3):e18046. Evolution of a major drug metabolizing enzyme defect in the domestic cat and other felidae: phylogenetic timing and the role of hypercarnivory. Pharmacogenetics. 2000 Jun;10(4):355-69. Molecular genetic basis for deficient acetaminophen glucuronidation by cats: UGT1A6 is a pseudogene, and evidence for reduced diversity of expressed hepatic UGT1A isoforms. I will never be a chemist – this stuff is very rough reading. These studies are so recent that most vets would not have learned of them in school. These studies mention cats have trouble detoxifying “phytoalexins” and “phenolic”-like substances found in nature. Herein lies controversy over which substances in plants and flowers – and how much – could tax or harm a cat’s liver. These substances in essential oils are hundreds of times more concentrated than in fresh flowers and plants. There was a nice lady named Sue Martin who published a whole website on this topic, called The Lavender Cat, which has been “temporarily offline” for many months. You can, however, read this article of hers and view her original interviews with doctors, etc, (via the Way Back Machine) here. Though there are only a few reports of cats becoming severely sick or dying because of essential oil exposure, the liver is essential to a healthy immune system. So a taxed liver, over time, means our cats become vulnerable to diseases like cancer. In fact, there is a known association between toxin exposure and lymphoma. Lymphoma is more common in cats than humans now. I suspect the cat’s detoxification limitations (not essential oils in particular, but all toxins) may be the reason. Did I ever use essential oils around a cat? I sure did – essential oils were in my bath, in diffusers, in my hand lotion. But that story did not end well. Bastet got high-grade lymphoma and died after barely turning 12. As you may know, I believe there were a number of other factors that probably contributed to the cancer, but this is a possible factor I can pretty easily not repeat. In spite of the carefree title, I hope others don’t walk away from Dr. Becker’s article assuming there is no need for caution. Fresh plants are 500 – 2000 times weaker than essential oil concentrations. The post includes the idea that The cat likes the smell of lavender, therefore the oils must be safe for him. But I would come to the slightly different conclusion of The cat likes the smell of lavender, so lavender flowers (not necessarily oils) are probably safe for him. Sure, the essential oil smells just like a safe natural flower, but it’s not a safe natural flower in this case– it’s a concentration that is 500 – 2000 times stronger than a flower. Does that cat know this? What about the long-term weakening of liver and immune system? The post says “Melissa has been using essential oils in her practice for about three years now…” The article says that Dr. Melissa reviewed her cat’s blood work repeatedly at first to make sure there were no ill effects. That is most the convincing part of the whole article. But, is 1 -3 years long enough to see long-term weakening of liver and immune system? I’m not sure. Damage “does happen.” The article clearly says, “Shelton has spoken directly to people with cats that have been damaged by essential oils, so it does happen – just not as often as many people think.” It’s very easy to miss this line in the article. As for me, if “it does happen,” that’s reason for some alarm. I truly hope, as the article implies, that these oils can be used safely somehow. I’m open to the possibility that it’s simply a question of quality and scale. The article implies there should be usage guidelines, but clear safety instructions are not included. But, I honestly think we’re getting into an area of cat and plant biochemistry where we don’t have all the details yet, so I personally will continue to err on the side of caution. Sure, a vet knows a lot more about cat health than a concerned cat lover like me, but vets (like some MD’s) have been wrong before – and what do we do when they contradict each other? We make our best guess and we choose the way forward we can live with. That’s all we can do. I would just like a link telling me what NOT to use in a diffuser, I have 3 rescue indoor kitties. I wanted lavender and eucalyptus but see they are toxic to kitties. I was searching for pain relieving EOs for my body pain but will not use anything if it means my kitties will be in danger. I’ve not bought a diffuser yet due to reading these posts. Won’t if it means my kitties health! Thank you. I know this is a controversial subject,and there is contradicting information.Isn’t also true that some essential oils are safe to diffuse around cats?Like Geranium, Cedarwood,Lemongrass?Some say Lavender is toxic,some say it isn’t, same with Frankincense.I have 7 cats.I do not apply EOs on them,just me.I always have the door open so they can leave the room.I diffuse oils that are supposedly safe for cats.I sometimes apply oils on myself.I noticed that twice after I applying oils on myself ,one of my cats left the room immediately.Of course,I love my cats and would never intentionally harm them.Toxins are everywhere.One of my cats used to lick the water from the tub,after one of us had showered.My husband used to use Glade diffusers,and sprays.For years,I have mopped the floors with vinegar and water,to avoid toxic cleaners.One of my cats would roll on the floor like she does for catnip,after I used a peppermint foot cream,I did not know then ,like I do now,that peppermint is toxic,but she and all my cats have had no ill effects. I used Natural Care flea spray directly on one of our cats who seemed to have the worst flea problem. Peppermint oil is one of the main ingredients in this spray. Within a couple days of putting it directly on him, he seemed lethargic and wasn’t his usual self and was mostly cat-napping, whether inside or out. Then a few days later, we noticed what looked like an injury on the tip of his nose, like a scratch that had scabbed over a bit. On closer inspection, it looked more like little tiny blisters. Within a couple more days, these things got bigger, protruding from his nose by a quarter-inch. It still “looks” like a scab but when I used a warm, wet paper towel to try to soften it and remove it, it would not come off, as if its definitely a growth. Online research has me thinking it is squamous cell carcinoma. Its Sunday today so we’ll be off to the vet tomorrow for hopefully more answers. The timing with treating him with that flea spray is just too suspicious and I don’t think anyone could convince me that it’s not related. I had sprayed that flea spray on the carpet in the house 2 different times in the preceding two weeks but the cats were outside all day afterward and the windows were all open and there were no reactions from him or the other two cats in the house. Please use caution! Can someone please help me. I diffused tea tree oil in my house for 3 days and decided to do some reading to make sure it was okay with my cats around. Come to find out, every website said to NEVER diffuse tea tree oil around cats due to the phenols in it, it is toxic to cats. Do you think my cats are okay? I stopped as soon as I read about it. But the essential oil was being diffused for a couple days. Do you think it will have any affect on them?? I need some piece of mind because Im freaking out that I hurt them. If a natural flea spray says it’s safe for cats and dogs then it is. You would have to saturate your cat every day for the rest of it’s life with peppermint oil for it to be toxic. I have recently bought a natural flea spray with peppermint oil and it says it’s safe for use on cats and dogs and around cats and dogs. If this was not true the company would have sooo many lawsuits. If it wasn’t safe they wouldn’t sell it. Is vetiver safe for me to use on myself only since I have cats? I used to use grapefruit and orange essential oil around the house… adding it to mop water, burning it, diffusing it in one of those diffusers that mists it out in water, and spraying it with a spray bottle into the air, on blankets, furniture, on tables to wipe them down with… anything. I had never had cats and didn’t know citrus is toxic to them. I have probably used like 2 ounces of citrus oils in the past… Most of the use was probably more than 6 months before I got the kitties. Does anyone know if the toxin degrades with time? Ive read the article and almost all the comments and to be honest I’m a little scared. As I was reading this i was diffusing lime and peppermint which are both toxic to cats so I turned it off imeadiatly. They seem to be acting normal jaut sleeping the day away. My question is are diffusers safe to use daily or should I just avoid it? What exactly is an essential oil? I bought this ‘natural’ anti-flea spray that has cedar oil, rosemary oil, lemongrass oil and white thyme oil…are those “essential oils”? i don’t know now if it’s safe….? Hi Wendy, yes, unfortunately those are essential oils. It’s been very common for companies to put them in natural anti-flea products because they do repel fleas and are safe for dogs — sadly, it doesn’t look like they are safe for cats, but the companies that make them refuse to consider this. Wendy, those oils are fine…except I’m pretty sure white thyme has the same phenol content as regular thyme…so I’d stop using that product. Cats are particularly sensitive to certain groups of oxygenated compounds called ketones and phenols, and some monoterpenes. And there has been a good amount of research done that cats are ok with a 0.1-1% amount of these oils. Meaning if a product contains a very small amount it’s okay but I wouldn’t buy any products for my cat with that stuff. Remember do not stress just be conscious. Not all essential oils are bad for cats, this is a fact. We know what chemical compounds cats are not able to process. Maya – can you kindly provide the sources for all this info you shared? I want to believe it, but I need to see the sources. I haven’t found any research or documentation yet to back up what you list as safe. I started my journey into essential oils because last winter I was sick with sinus issues the entire winter and I was determined not to be sick this winter. I am a nurse and I work in a very busy urgent care setting. I work with another nurse who was always sniffing essential oils and never gets sick. So I thought, is there is something to this? I felt like I had nothing to lose. So I began my search for oils, and wow it is very overwhelming all the information. So I just tried to make the best educated decision. So I got some oils and a diffuser and started applying the oils topically and diffusing them. Great. On to my kitty…..Pepper. Pepper better known as Peppy is a sphynx and as you know she has no hair. And she is sticky bald which means she truly does not have any hair anywhere like some sphynx’s have a peach fuzz she has a little bit on the bridge of her nose. So I am happily diffusing my oils and Peppy is sitting in her usual spot right next to me. And I noticed what appeared to be seizure activity. She was weak one one side flopping over…..breathing changed…..sort of agonal in nature with staring. The spell lasted about 3 minutes and she did have the urge to defecate when she was waking up……which I think is a sign of seizures in cats. She has no history of seizures. She seemed to come around pretty quickly. Peppy is an older cat about 8-9 years old. So I decided to just watch her and see if it happens again. I kept diffusing daily and sure enough it happened again three days later and this time she had projectile vomiting with the seizure and that is when I knew it was neurological in nature and BAM it hit me like a ton of bricks it was the oils. I always knew some oils are toxic to cats and I never applied them topically to Peppy. So I waited until she came out of her spell which was exactly the same as the last time but now with projectile vomiting. And searched online and sure enough the oils I was using are toxic to cats. I turned off the diffuser and whisked peppy upstairs and actually opened a window up there for fresh air for her and opened the windows and doors where I was diffusing as well. So I also thought to myself with the second seizure oh my gosh Peppy is getting a double whammy, absorption through her skin and breathing it in as well! So I decided I was not going to diffuse for two weeks and see if any seizure activity would return. Well Peppy did not have any seizure activity in that two week period. And I will say I have not diffused at all since that second seizure and Peppy has not had any more seizure activity. So do I think the oils caused the seizures? The answer is yes. Absolutely. I have learned a lot since then about the feline liver. But I do have a question do you think that I caused permanent liver damage? Peppy has been completely back to normal since the second seizure and no diffusion of oils. So have the oils worked for me? I also will have to say yes. I have only gotten one cold so far and the symptoms have been less and not as long. I only apply the oils topically to myself and never apply them around little Peppy. So the bottom line, I would probably use essential oils around cats with grave caution. I found your blog on a search after I learned certain oils are “bad” for cats. We have 6 and we love them all so much we wouldn’t want anything bad to happen to them. That said, each one vies for our attention in their own unique way. We just recently started diffusing essential oils in the bedroom at night and the computer room in the day time while we work. I noticed right away, when I diffused peppermint, that 3 of our cats were immediately intrigued. They put their noses directly into the stream and would sniff it for seconds on end. 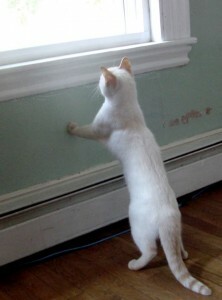 I just read yesterday that peppermint is bad for cats – really bad. So, of course, now I’m panicking. Hence my rabid search for answers! Also, I’ve been diffusing lemon the past couple of days, and one of my cats – who never sleeps on the chair beside me (he’s my husband’s cat and always sleeps on a chair near his desk) has taken to spending his days in this chair, which happens to be directly in front of the diffuser I set up. He sniffed the lemon stream that first day, and made himself comfy. And of course, I read that lemon is horrible for cats. I’m sitting here shaking my head at myself. Can you offer insight? I see many blog sites and experts saying not to apply certain essential oils to animals, but what about diffusing them into the air? Common sense tells me if it’s bad for my cats they’ll flee the area instinctively, but there’s that little voice inside my head that tells me my dog would probably drink a puddle of anti-freeze – which is the opposite of “fleeing danger instinctively”. Thanks so much for your informative blog, and question/comment section. So am I ok to still use diffuser reeds with lavender oil in the bathroom? And how about when showering I like to drop citrus oils in the shower but one cat loves to sit outside the tub? Is she going to be ok if I keep up my aromatherapy practices? I was concerned because I applied lavender oil to my neck, and didn’t realize that I still had traces of it on my hands after handling my cat brifely, will he be okay? Hello. I’m looking for some help with a mystery. My 9 yo cat was staying with a friend, she noticed he was limping with a swollen foot. She put two drops of highest quality myrrh oil on his fur which he licked off immediately. He started to salivate profusely and she rushed him to the vet. He was admitted and by the next morning he was in severe respiratory distress. Xrays showed no signs of heart or lung problems, no fluid either. Blood work was all normal. Breathin got worse, was sent to a specialist where they kept him on IV fluids and oxygen. My sweet cat died a couple of hours later. No one knows what caused it and poison control does not think it was related to the myrrh oil. I have been a vet nurse for 28 years and this is a mystery to me. My gut says it was the oil…he was a very healthy yet very sensitive cat. Any thoughts you could share would be greatly appreciated! Thank you. Does anyone know of a safe non-toxic “perfume” alternative to EO’s and to most commercial colognes which are full of toxic fragrances? I would like something for personal use and for the home that I can feel is safe around my 5 cats. I use all non-scented personal care products and cleaning (vinegar, peroxide and isopropyl alcohol) but have been using small drops of EO’s, mostly rosemary, lavender and patchouli diluted with isopropyl alcohol when I want a little perfume for going out. Now, even this worries me. Also, what about the peppermint oil used in my Dr. Bronner’s bar soap I use in my shower and on my face and hands? Is that a worry as well? Very informative site about not using essential oils on cats or over diffusing their living quarters. Your are correct; a cat’s liver has not changed and claims that it’s okay with ‘the right oil’ is pure hyperbole. In my experience, the MLM’s multilevel hypesters are the worst for dishing out bovine excrement to sell a product and gain ‘more downliners’ and anyone else ‘thinking’ they can change a cat’s physiology with hype for sales. Keep up the good work, and thank you for the compliment. I sent you a private message from your contact page. I have a 2 year rescue cat. In the last 6 months I’ve been spraying citronella oil diluted in water to ward off mosquitoes & recently started adding the citronella to my lotions as it lasts a little longer for keeping the mosquitoes at bay. I’ve sprayed peppermint oil on the sofa to keep my cat off it—he avoided it like the plague until the scent finally faded away. In the last month I’ve started using tea tree oil, diluted in a carrier oil, to treat my in-grown hairs. I want to start using citrus oils in a baking soda deodourising disk around the house. I live in the tropics with lots fresh air, and my cat is house cat with unfettered roaming. I would like to know if I need to stop using all these essential oils? And, are there any essential oils that I can use around my cat? Please note I have no intention of ever using essential oils on nor feeding them to my cat—just in the home. Gigi, I have just read that tea tree oil is extremely toxic to cats. I feel horrible, as I have also been using the pure oil on my skin when I have a skin aliment & it is also in my liquid castile hand soap. I will stop using it until my research shows me that what I read is false. I hope my use of it hasn’t harmed my beloved cat. Hey Cait, it’s a good question – about your face cream with EOs & your cat’s wellbeing – but honestly I don’t think anyone can answer it with 100% certainty because we don’t have enough data yet. Here’s my guess: at the very least I would not let my cat’s fur touch my skin as long as the lotion is still fragrant. I’m Sue Martin, the Lavender Cat. Yes, my email is inactive on my site. Liz’s site caught my eye and impressed me with her presentations of essential oils and cats and the whole cat. As I am a guest, I wish to defer to Liz regarding the answer after Liz and I chat. I was also excited about the article by Dr Becker and Dr Shelton, but it was a downhill journey. When you navigate to links posted by these doctors for crucial safety information, you have to spend $40 for the pet guide to essential oils (or $30 PDF file) and/or $75 for the Essential Oils Desk Reference ($90 here in Canada). They have this very convincing article that greatly encourages pet owners to delve in to to essential oils, but in order to do so safely you must send them money, just for research/reading. This is not the attitude of people who really care about the safety of our animals. It certainly breeds negligence in well-meaning pet owners. Again, this is not a slam at the products of Young Living, but the exclusivity shown by Dr Shelton. It’s like a physician saying he will only help you if you use brand-name medication with the exact same ingredients and quality control as a generic, when that physician makes a cut of the earnings of that name brand. It’s a dirty thing to do. The honest and selfless approach would be to recommend multiple brands of the highest quality and information given to the consumer as to how to properly research said quality and liver-effects(!) on their own. I think it’s very wrong to put suggestive ideas of essential oils in cats without simultaneously cautioning more than just quality of oil. There is so much to know before a person should contemplate usage on cats. Relying on partial information can kill. This article ( http://www.experience-essential-oils.com/essential-oils-for-cats.html ) doesn’t skimp on acknowledgment of the missing enzyme in cats and goes over what compounds of essential oils should absolutely be avoided (Ketones, Phenols, Monoterpenes) and the essential oils containing such are listed, as well as what approximate percentage of the offending compounds they contain. The wording of the article is a bit in need of an editor, but it it has much useful information. Interestingly, the author of the article has their own shop with therapeutic grade oils but also suggests reading Dr Shelton’s work (and thus optionally purchasing from YL). That’s some objectivity for you. This website also contains a VERY detailed article on what constitutes therapeutic grade, how it’s made and tested, etc, etc. I’m not ruling essential oils out for potential extremely mild and diluted use on occasion in my cats, but it’s not a decision to make lightly and the option of completely avoiding the risk may be the best one. I agree with most of your thoughts here. It does seem like the fellow is peddling YL essential oils, but from his point of view, that is the only company he knows “for sure” that has “pure” oils. A lot of the other ones have junk added in them. They aren’t regulated the same way other things are. That is a good and bad thing. But saying that EOs are good for cats, in such a general manner is not good practice. First and foremost, each critter is an individual, and like humans, some things may be ok for one and not for another. BUT there are also some oils out there that are absolutely not ok near cats. I hate that the reference guide is so expensive. I know there are other ways to find the information online, but I am not certain of the costs. Sorry…I posted the wrong website address above! Essential oils are safe for animals. You can view my facebook page Everyday Goddess for tips on how to use essential oils to your benefit. Sorry, I don’t believe they are safe for CATS, again, it’s known that cats have a different liver enzyme issue than other mammals. I use essential oils daily. I spray ants with a mixture of clove and peppermint. I have three cats. They are all still very healthy and alive. When I diffused lemongrass in the home, all the cats wanted to be by the diffuser, AND…mama kitty who has been sick since I found her had begun interacting after introducing oils to her. *she had previously spent almost a year in the closet or other dark space. Now she runs and plays more and has a better appetite. Nothing is 100% no “one size fits all in life!” I don’t believe the oils are all toxic if you use your intuition. I use doTERRA CPTG OILS…everyday. young living is crap and I wont give it to my pets. EMI, I wanted to email you via Facebook but there are a lot of Everyday Goddess pages on FB. Can you email me? elizaday66@gmail.com. I do not put essential oils on my cat but I burn them in a diffuser and, of course, I put diluted Eo on my skin occasionally..usually on my wrists or on a chakra point. I only use francincense, patchouli, sandalwood and, occasionally, mugwort. I haven’t noticed any changes in my cat but, of course, I’m worried after reading certain things online. Would just smelling the diffused oil cause problems? Can I ask why you think Young living is not a good product? I currently have in my supply, NOW, YL, and one other that I cannot re-call the name…. Thank you, Liz. My eyebrows raised high when I saw that topic from Dr. Becker! I wasn’t convinced at all! Thanks for expanding on this topic. Sure thing Pam, and thanks for the encouragement. Cat enclosure – yay! I look forward to telling more about it! Thank you Ingrid and Janet! Yes, that’s how I feel – we’ve got other natural & and alternative healing options that are less risky. Yes, the Lavender Cat research has helped many write their own articles or books, an example; Kristen requested information from me to use in her book, which she did and was to give credit to the Lavender Cat and my sources. I still have the emails of our conversation. The articles you posted are good in that they utilize the research and articles that I also shared with the public. A cat’s physiology has not changed regarding processing of essential oil compounds and there is proof of toxicity by essential oils, nothing has changed and I still stand by my findings; no eo’s on cats. My source for toxicology in cats was Dr. Khan, toxicologist DVM, Toxicology Urbana, Anthony Burfield, eo trade chemist and many papers, some of which are also mentioned in a familiar format. Glad to see you are attempting to see both human sides, a cat on the other hand can suffer with the human’s wrong choice. The therapeutic grade oil is hype and certified aromatherapists are not to prescribe. Yes, Robert Tisserand is well known and respected, I’ve read his works along with many others in the field. Please take this with the kind conversational mode in which it is sent. Good to see so many ideas in one place. I am very grateful for your article about essential oils and cats. So may people rave about essential oils and how wonderful they are for animals, especially the so called high quality oils. Years ago I had a horrible ant problem in our house and posted the question to an animal communication group asking how to deal with the situation. One response was to place peppermint essential oil on the ant trail. I jumped up and did just that. I went back to my computer to find a response warning that peppermint essential oil was toxic to kitties. In horror I jumped up and washed the baseboards that I had just placed the oil on. Was I too late? The whole house reeked of the smell. Every since then I have been overly concerned about the affects of essential oils on kitties as well as other animals. Then last night I read an article and watched a video on You Tube by a very respected person in the animal field, about a new essential oil diffuser that she uses with her animals. The drops of oil are diluted in distilled water. I was concerned when she said to point the diffuser in the direction of where the animal sleeps. That didn’t seem right to me. Now I read your article this morning. Thank you. I got the message loud and clear. I will not be using essential oils around kitties. Thank you for including the scientific information. As Ingrid mentioned in the above comment, there are so many other holistic modalities available, why take a chance. Thank you for addressing this controversial topic in such a clear and concise manner, and separating out hype from science, and assumptions from facts. Perhaps it is, as you say, a question of quality and scale, but I’m with you: I’ll continue to err on the side of caution. 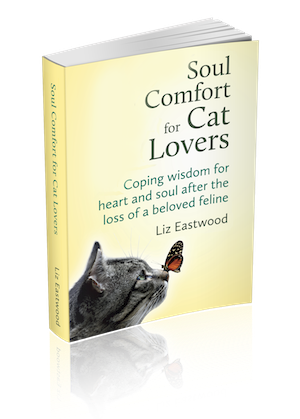 With so many other holistic modalities available that are completely safe for cats, why take chances?